Otonokizaka High School has been saved! Despite having to withdraw from the Love Live!, the efforts of μ's were able to garner enough interest in their school to prevent it from being shut down. What more, following the conclusion of the first, a second Love Live! is announced, this time on an even larger stage than before. Given a chance for redemption, the nine girls come together once more to sing their hearts out and claim victory. However, with the end of the school year approaching, the graduation of the third years draws near. As they attempt to reach the top of the Love Live!, they must also consider their future and choose what path the group will take. Though the question of whether to continue without the third years or disband weighs heavily on the minds of its members, μ's must quickly come to an answer with graduation right around the corner. The series also has released a mobile rhythm game titled Love Live! School Idol Festival for iOS and Android, released in 2013 for Japan and in 2014 for English users. If there have been any worries about the future of the idol genre, Love Live 2 has dispelled them. It's hard to deny that the first season of Love Live began with a rocky start. There wasn't much to set itself apart from other idol shows (especially with the likes of Idolmaster and Aikatsu dominating the genre) and it fell prone to melodrama far more than it should have. But, much like K-ON's mediocre first season and excellent second season, Love Live 2 has managed to do more than improve upon its predecessor - it has genuinely become an amazing anime. I won't lie, I was no fan of the franchise when the TV series made its debut in early 2013. I dropped it after the first episode aired and wondered later on what people saw in the series. But now having finished the second season, Love Live has become one of my favourite anime franchises. Certainly it is not an anime that will test the mind or change anyone's life. It is simply a story of nine teenage girls forming an idol group together. However, it would be an insult to describe Love Live as yet another "cute girls doing cute things" anime, as it is a far more meaningful experience. The drama feels genuine this time around, and by the end it is hard to prevent the tears from rolling when the story of μ's reaches its end. From the very first episode of the second season, it is clear that Sunrise has made a significant effort to improve the series. It looks better, sounds better, feels better and is far more fun to watch. Most importantly, the girls of μ's all feel like genuine characters now. Honoka's passion makes her truly seem like the leader and centre of the group, whereas the first season didn't have much reason beyond "well, somebody had to be the leader, right?" Even the characters who were given little to no screen-time in the first season (Rin, Eli, Nozomi and Hanayo) are fleshed and given their own episode to shine. It is finally a story about the nine of them. Considering there have only been twenty-six episodes to develop a cast of nine characters, Sunrise has done a commendable job of doing so without neglecting the story in return. Perhaps the characters could have benefited from another season of episodes, but they hardly feel lacking by the end. The addition of a rival idol group (A-RISE) also makes the story feel less insular. It is no longer confined to the school itself, and with the school's closure no longer being an issue, the girls can finally focus on performing as idols do. Nico is easily one of the show's greatest assets. Sure, her "nico nico-nii" catchphrase is cute and all (I go a little bit crazy whenever she utters it), but Nico's presence accomplishes far more than simply being a vehicle for the cute. Of all the character-focused episodes, Nico's is the greatest. It shows that she really, truly cares about the group and is not simply in it for pride and ego. The idol industry is Nico's life, the act of being an idol her most treasured dream. She cares deeply for her siblings and performs primarily to make them smile. She's a kind person inside- contrary to her rough behaviour with the rest of μ's. Perhaps that behaviour may make her somewhat unsuitable for the role of an idol, but she's more serious about it than anyone else. Nico may not be idealised as idols usually are, but that flawed, genuinely human side of her makes her makes her all the more loveable, I think. Even if she does not resonate with you as a character, it's hard to deny that she at least provides an interesting contrast with the rest of μ's. It would not be anywhere near as interesting without her. The story peaks in the last four episodes. With the graduation of the third-years quickly drawing closer, a tear-filled goodbye seems inevitable. It is very similar to the final episodes of K-ON's second season. With the prospect of Nico leaving and μ's potentially being disbanded after graduation, I could not help but feel my chest tighten a bit. And then the final episode really drove those feelings home. Perhaps they'll join together once again and find careers as professional idols. I doubt it is the end for Nico, Eli and Honoka. Like most idol anime, Love Live has a fantastic soundtrack. All the songs the girls perform carry their own theme and message, and none of them (aside from the opening and ending) are used more than once in the anime. Each song represents a new stage for μ's, another step forward as performers and as people. The music peaks with the performance of "Snow Halation" in the ninth episode, a rising, sad yet uplifting piece that showcases the appeal of μ's. It is probably one of the best vocal tracks I have heard in an anime to date. There is also a really cool scene at the end of the 12th episode that I won't spoil. Everything with the music sorts of 'clicks' in that moment. It should be noted though that the ninth episode does blunder a bit with its choice of music. As the second-years traverse through a snowstorm, there is an incredibly melodramatic, orchestral piece blasting in the background that would feel more appropriate were demons from hell rising up and setting Earth on fire or something. The second season has improved so much that it is frustrating to see it regress to the first season's melodrama, even for just a brief moment. As for the visuals, Love Live looks well above average. The CGI during the performances can be a little bit distracting (and I know some people despise CGI of any form) but between that and low frame-rate, off-model animation, I would gladly take the CGI. It certainly looks better than Aikatsu's CGI, anyway. The rest of the visuals on the other hand holds up reasonably well. There are scenes here and there where lazy, static shots are used for longer than necessary, and while it certainly is no Attack on Titan, Love Live looks just fine. Love Live has come a long way from its slow beginnings. While it will hardly convert anyone who detests the 'moe' art style, those who have even the slightest inkling of interest in the series will likely find the second season to be at the very top of the idol (and perhaps even music) genre. An anime can be both cute and a genuinely great story, as is demonstrated here. Now, where's my Nico spin-off? After finishing 1st Season of Love Live: School Idol Project, I must say, Season 2 sure stepped up it's game. I enjoyed Season 1 a lot too, but Season 2 has just been something else for me. For those of you who don't know, Love Live: School Idol Project is based off of a real live idol group called Nine Muses. They all go by different names in the anime itself, but it's a pretty neat concept. Their goal in Season 1 is to keep the school from shutting down by forming an idol group. In Season 2, their goal is to make the Love Live, and win it all, this will be the last chance for them to do this together as members of the group are graduating after their third year. Simply, I don't like many music/idol animes. They stray too far away from the main plot. Often times, they become too focused on being cute, and adorable, much like K-On! did, and steer away from the story as a whole, and for me that's a complete turnoff. With Love Live: School Idol Project, I have not had to worry about that at all. The story is not really comedic in any form, which in turn makes the quality that much better as it truly focuses on it being a slice of life anime, rather then throwing little "hilarious" moments all over the place. In Season 2, we see a lot more drama, heartache, and realization. After eating through all 13 episodes, it's been nothing short of emotional, and I love it. The theme stays the same, where they're all dedicated to making the best of their school idol group while they can, and they continue to have a goal in mind that they can strive for together. The art is once again fantastic, other than, in my opinion the 3D they use for their performances. I dislike 3D animation, but that's my preference. Other than that, I thought it was really good. I love the costumes they wear during their performances as well. The sound, well, if you're watching an anime about school idols, I'm pretty sure you expect good music, and this is nothing short of that. Snow Halation, one of the songs they perform in this season, was just phenomenal (And it's a real song by Nine Muse's, check it out!). I personally enjoy the music they sing, and the BGM is well placed. Characters, well, there's nine of them, so I'm not going to run through each one as I'd probably do a messy job anyways. I'll just say that each one of these characters, Nico, Nozomi, Eli, Honoka, Umi, Kotori, Rin, Hayano, and Maki are all unique characters in their group. They all have had struggles (As seen in season 1) and coming into season 2 that's no different, however, they have developed incredibly over the span of this season. They've all conquered certain issues with themselves, and they've done this together as a group. That's one of the huge striking points for me, is that no matter what situation they're in, they figure it out together, and they're all there for one another whenever it's called for. Easily the characters are the strongest point within this anime. Quite honestly, I've never really enjoyed an anime that's been centred around music much like Love Live. This has been such a fun ride for myself, and while I don't think this anime is for everyone, I'd fully recommend you at least give it a try. I'm pretty sure you'll connect with the characters in one way or another, and that's one of the many reasons this anime is so special. I don't think I've ever cried such happy tears before. Best choice I made watching this series, all because of a Nico-Ni .gif. When Love Live! 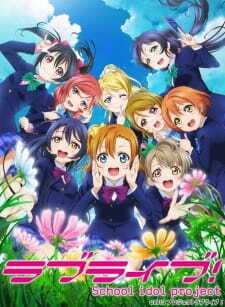 School Idol Project first aired in Japan, it became a hit sensation, captivating the hearts of many. The show was surprisingly good, with an enjoyable cast, entertaining songs, and a solid story. It was a massive success, and with its popularity came a second season. This might make some people feel anxious, thinking this to be a sell out for more money, but their worries can be put to ease; regardless of its intentions, I believe this second season to be even greater than the first time around. Spoilers for the first season to follow. Love Live! School Idol Project Second Season follows μ’s as they get a second chance at the Love Live idol competition after their withdrawal from the first. Beyond that however, the girls are forced to look farther ahead and contemplate the future of μ’s as the third year’s graduation begins to rapidly approach. The story isn’t anything too original, but that’s overshadowed by the fact that it’s done well. Love Live!’s second season will make you laugh and feel good, but at the same time it can bring you to tears. There is a lot of emotion packed into its later episodes, and when the season comes to a close, you won’t want to see them go. The story is brought to a finish with an ending that wraps everything up nicely, making it a satisfying journey from beginning to end. μ’s brings multiple main characters to the table, so there’s a guarantee you’ll love at least one of them, if not all of them. From genki girl Honoka to narcissistic Nico, there’s a lot of variety to be had. More important than that, however, is that the show still manages to bring some depth and development to these characters despite there being so many. The spotlight is given to the girls who weren’t featured during the first season, such as Nico and Rin, but development still continues for the others, such as in Honoka and Umi. Add to that some nice side characters like all the imoutos, as well as some actual presence from the rival idol group A-RISE, not to mention those amazing alpacas, and it is clear that the show does a wonderful job with its loveable cast. Of course, this being an idol show and all, the music is a major component of this show, and I feel it doesn’t fail in this regard. The OP and ED are pretty good, matching the feel of the series quite well. The insert songs are really the standout though, with a mood and lyrics that depict the moments of the show magnificently. My favorite of the bunch definitely has to be “Snow Halation”; when it is being sung, I had shivers going down my spine. Of course, the rest of the bunch is great too, such as “Aishteru Banzai”, “Love & Peace”, and even a return of the opening of the first season, which is tied in nicely. The soundtrack is pretty great as well fitting the mood nicely and bringing the tension and emotion when it needs to be brought. Overall, the music of the series is great, as it should be. The character designs are all nice to look at, and there’s probably going to be a design that you love because of the massive cast. The animation runs smoothly for the most part, and can be pretty beautiful at times as well, such as during the performance of the aforementioned “Snow Halation”. One problem that I did have with this show, however, is the CG that is used during the song performances. It is pretty jarring and takes away from what would otherwise be beautiful scenes. Thankfully, the usage of the CG has decreased and the quality has increased slightly from the last season, so it wasn’t as bad as before, but I still wasn’t a big fan of it. Other than that though, this is quite a beautiful show to look at. All in all, this was a very entertaining show to watch. Even with the bothersome CG, watching the girls of μ’s working to win the Love Live and performing their songs was a wonderful experience. This second season made me fall in love with μ’s even more than the first season had. Anyone who liked the first season will definitely love this; even if you didn’t, I feel as though the second season was a great step up from the first, so you might still enjoy it. While the story is brought to a close for now, I can’t wait to see what the Love Live! series has in store for us next. Love Live! have a simple story, it tells us about 9 girls that competing in a School Idol Competition. Well, if we look deeply to the main idea of the story, Love Live does not have an originality. Although not having an originality, the story is full of excitement, the plot have a great balance between the main story and the fillers. As for the art, we have a clear and beautiful animation, despite having a CG during dancing and stage performing, Love Live! have a well-produced animation. What can I say about the sound? Is wonderful in my opinion, the seiyuu did an excellent job to bring such character to the screen, everyone have a decent voice and brings uniqueness to the characters. The songs in the series are very good indeed. With a slice of life genre in hands, a development is the strongest body of this anime. Each character has their own story/ problem, it makes the developments successfully makes a deep character. Each of them has a unique personality itself. Besides that, Love Live is not for everyone, the main attraction of the series is aimed to the male audience. Some of the female viewers maybe not really enjoy the series, there are also people that don't like idols founds out Love Live not interesting. As for myself, I enjoy the series although not fully enjoying it. It is fully recommended to those who seeks an idol genre. Looking back on the top selling anime series of the 21st century by year, you'll find some shows you'll expect to see, and some you might not have even thought about since they came out. Let's look back and see what shows sold the most in their years.